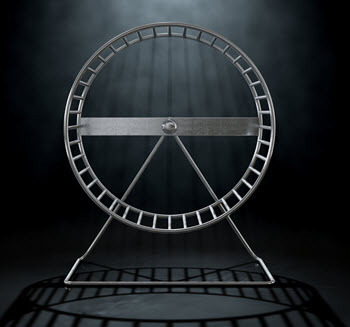 Don’t let your event program get caught up in a spinning hamster wheel. While show schedules and workload don’t often lend themselves to reflection before you have to throw yourself into the next event, understanding how each show adds value to your exhibit program is essential to evolving your event program. Determining your event program for the coming year isn’t a simple equation. While some events may continue to be a perfect fit for your program, others may be questionable even though you’ve participated for years. How can you determine if an event should be part of your mix moving forward? 1) Document your program’s goals. If pipeline is your goal, are you trying to connect with new prospects? Generate meetings with existing clients to talk about new products or enhancements? Grow brand awareness? All of the above? Once you’ve documented your goals, you have criteria upon which to objectively evaluate individual events. 2) Research each event and who attends it. Ask the event organizer if they have a prospectus with attendee data — or better yet, an audit. If not, ask for a list of past attendees. Compare this data to your target audiences — is it a match? If not, then look for reasons that the event supports your objectives, beyond “we’ve always done this event.” Just as your target markets may change over time, so do the audiences that attend shows. 3) Validate your decisions. At each show, check your data to decide if the data and your research ring true on the show floor. Review your leads beyond assigning them to sales for follow up. Are you seeing your target audience? How does this compare to other events? At-show surveys. Add survey takers to your exhibit to ask questions related your strategy and attendees’ goals for the show. Do they match up? Are they looking for the types of products/services that you offer or is there a disconnect? 4) Always check out the competition. How are your competitors doing and how does their attendee traffic compare to yours? Create a competitive audit by gathering information on what others are doing on the show floor. 5) Step off the wheel and review the facts. Before it’s time to re-sign for next year, review the data that you’ve assembled and evaluate what it means to your program and objectives. This may mean you consider eliminating an event, growing/shrinking your presence, or adding an offsite gathering to capture additional time with key customers. While it’s not easy to stop the spinning wheel, having objective data and facts can help you broach new ideas and suggestions to your team that will help you look more like a star than a wheelspinner.